Black Dynamite failed to light up the box office in 2009, but has since gone on to build a cult following and deservedly so. 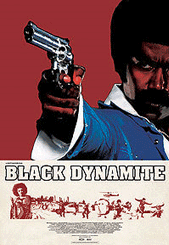 As you can probably tell from the synopsis and title of the film, Black Dynamite is a spoof of urban action movies (blaxploitation, if you prefer) of the 1970’s. Much like the majority of 70’s urban action movies, the final explanation behind the conspiracy is hilariously convoluted. Add to this a series of music cues which mimic the actions as they happen on screen and you’re left with one of the funniest features of the last decade. By way of hit rate, the film is painfully funny, but what makes the film work so well (similarly to earlier mentioned ‘Young Frankenstein’) is the clear love for the genre being satirised and parodied. Director Scott Sanders, along with star and writer Michael Jai White, know the material inside out, as Black Dynamite mines everything from Shaft to Disco Godfather. This is a film where, if the volume was turned down, it could easily pass as a proper movie from the era, with little, if any, visual hints telling the audience that it is a 2009 spoof.